In a recent Op-Ed at Israeli newspaper Ha’aretz – former Israeli cabinet minister Uzi Baram (born to Arab Jewish mother from Syria) said that extremist Jew members of Benjamin Netanyahu’s government are rallying on US president Donald Trump to help destroy Islam’s sacred Al-Aqsa Mosque and Dome of Rock at Al-Quds (occupied East Jerusalem). These fanatic religious Jews believe that the Muslim structures are hindering the fulfillment of Jewish salvation represented by the construction of the so-called Third Temple. Several leading Israel rabbis at the Sanhedrin organization have claimed that two powerful pro-Israel world leaders, Vladimir and Donald Trump, not only support Israel’s right to exist – Trump even accepts Jewish right to Jerusalem as their spiritual inheritance. It is historically unprecedented (reported by Israel Today, November 15, 2016). Rabbi Hillel Weiss, the top gun at the Sanhedrin sent letters to both Trump and Putin urging them to work together to fulfill a project that will benefit all mankind – the rebuilding of the Holy Temple atop Jerusalem’s hotly contested Temple Mount. Torah (Old Testament) was written by rabbis in 1312 BCE. It doesn’t mention that Temple Mount would be destroyed first by Babylonian in 586 BCE and later by Roman in 70 AD. Furthermore, neither Torah nor the Christian Bible calls for the reconstruction of Third Temple. 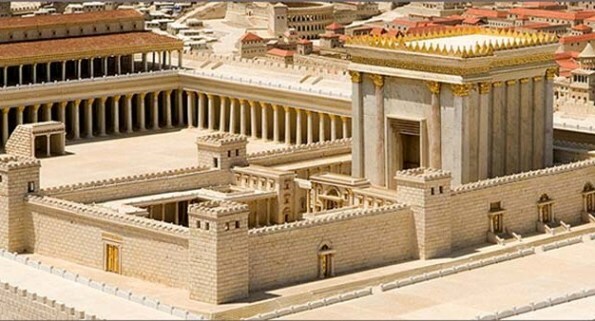 According to the Jerusalem-based Temple Institute, it got the three things needed to rebuild the Third Temple; 1) a plan (see the model above), 2) one million stones for the building, and 3) Red Heifer. Ironically, in October 2016, UNESCO declared that Old City of Jerusalem (occupied East Jerusalem) had nothing to do with Judaism. Jerry Rabow in his 2002 book, 50 Jewish Messiahs, claims that since the disappearance of Jesus (as), more than 50 men and women have claimed to be Jewish promised Messiah. In my life time, I have read two Jewish Messiahs – multi-billionaire George Soro and former US president Barack Obama.